Have you ever had a business idea that you wanted to pursue? 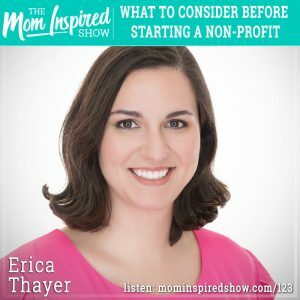 Today we have Erica Thayer of Project Heart on the show and we talk about starting a non-profit. She shares with us her journey with her son who was born with a heart congenital disease and how she felt there was something missing when it came to helping kids with this disease. We talk about why it’s so important to know your “why” when starting a non-profit or business. Why it’s key to know your strengths and when to hire someone. One topic that really stood out to me is when Erica was thinking that someone should definitely do something about this, and then realized that someone was going to be her! Hear what she says about this topic and more on the podcast.